After the entry of Slovenia into the EU, road freight transport has increased sharply; namely, the volume of tkm of Slovenian transport operators in the period 2004-2007 increased by 52 %. Particularly alarming is also the growth of road freight transit through Slovenia – the number of movements of cargo vehicles across the border with Hungary increased by 112 % in the same period. The indicator shows the modal split in freight transport in the Republic of Slovenia and in the group of selected European countries. The data for Slovenia is indicated by development indexes of freight transport in road, rail, port and air transport for the period 1990-2007; the data for other European countries is indicated by shares of tkm (tonne-kilometres) by road, rail and inland waterways in the period 1992–2004. The starting point for modal shares of freight transport from the environmental point of view are the differences in the environmental efficiency of transport modes (use of resources, greenhouse gas emissions, noise and other pollutant emissions, use of land, accidents, etc.). The differences provide an opportunity to influence the environmental impact of freight transport by transport policies that can change the ratios of use of individual transport modes. Due to insufficient data in Slovenia, it is not easy to assess the modal shares in freight transport by individual transport modes; therefore, different estimates can be found in domestic and foreign literature. In 2005, the Statistical Office of the Republic of Slovenia updated the data for the period 1992-2004, which should be more reliable now. However, the data still has a fundamental methodological deficiency of not considering the tkm of foreign transport operators on Slovenian roads and the tkm that Slovenian transport operators perform abroad. Although the shares of road freight transport are according to the previous assessments far more unfavourable, they are still slightly lower than the average of the EU-15 and EU-25 (EEA, 2006). Despite the data problems it is obvious that road freight transport has been increasing the most and taking over a larger share of freight in Slovenia, especially after its entry into the EU. The transport of domestic operators, indicated by tkm, increased in the period 2004–2007 by 52 % (on average by 15 % annually). Rail freight transport increased in the same period by 14 % (on average by 5 % annually). 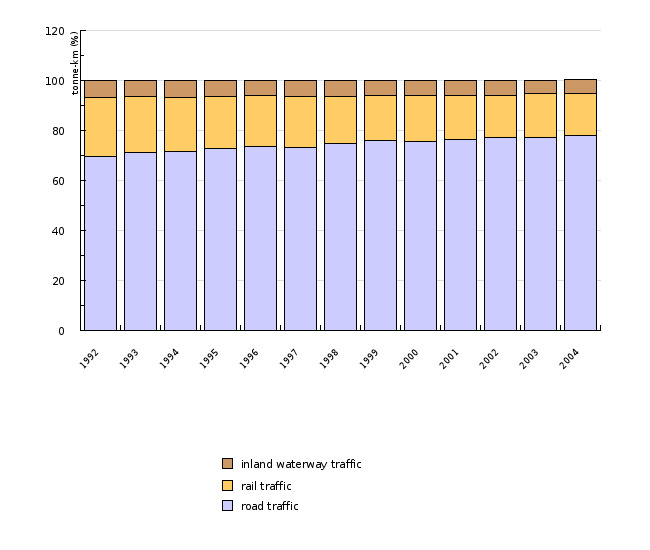 The growth of both transport modes was moderate before the entry of Slovenia into the EU; namely, since 1993 road transport increased on average by 6 %, and rail transport by 3 % annually (Šegan, 2005). Also alarming is the data for road freight transit through Slovenia, which is unfortunately not included in statistical monitoring. In the period 2000-2004 it increased on average by 10 % annually, while after the entry of Slovenia into the EU at an even faster rate – the number of movements of cargo vehicles across the border with Hungary increased by 112 % in the period 2004-2007 (The Slovenian Police, 2009). An assessment of freight transport by trucks, prepared annually by the Slovenian Roads Agency, confirms the strong increase in road freight transport in Slovenia in the last seven years. It is estimated that the transport by light, medium and heavy trucks and trailer vehicles on Slovenian state roads increased by 73 % in the period 2001-2007. The increase in transport by light and medium trucks was smaller in this period – around 37 %; transport by heavy trucks and trailer vehicles was much higher – around 133 % (Slovenian Roads Agency, 2009). The share of air and maritime freight transport in the territory of the Republic of Slovenia is not large; however, maritime transport at the port of Koper, as the most important freight terminal in the country, is an important source and destination of inland freight routes. The volume of maritime transport has been increasing throughout the years; in the period 1990-2007 on average by a solid 6 % annually. The volume of air freight transport, conducted primarily through Ljubljana Airport, has been changing for some time. The last strong increase was indicated after the entry of Slovenia into the EU, when it increased on average by 49 % annually in the period 2004-2007. The addition of a new business partner for express mail transport (UPS) in 2006 at Jože Pučnik Ljubljana airport contributed a lot to this increase; namely, UPS uses the airport as a transport logistic centre for the further dispatching of consignments to other parts of South-Eastern Europe. Only in the first year of business of UPS in Slovenia, the freight air transport increased in total by 130 %. Considering the state of the transport policy and the (non)competitiveness of railways in Slovenia, we can expect a continuation of unfavourable development by an increase in the volume and share of road freight transport and decrease in the share of railways. In the free market of transport services, which does not include all costs caused by individual transport modes, road freight transport is more competitive, since, as a rule, it is faster, cheaper, more reliable and more adjustable than other transport modes. Such trends are also accelerated by production and trade processes; for instance, delivery on time, which demands an adjustable transport mode. At the same time, production and trade with cargo of higher value has been increasing, which is dominated by road transport; on the other hand, the production and trade of bulk cargo, which was traditionally transported by rail, has been decreasing. An additional impulse for the road freight transport in Slovenia was the entry into the EU, which eliminated administrative barriers at borders. Moreover, the harmonisation of national railway systems, which will enable more fluid rail transport across borders, is still being conducted. The road transport mode is prevailing also in terms of EU freight transport. Its share has been increasing year on year, and in 2004 it amounted to 77 %. 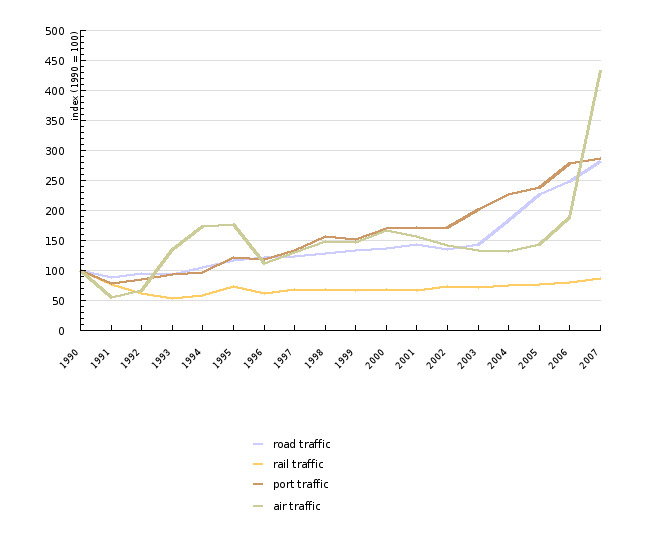 On the other hand, more sustainable transport modes (rail and river transport) have been decreasing. Methodology and frequency of data collection for the indicator: The data on road freight transport (public and private) is collected by the SORS and published in the regular annual serial publication “Statistical Yearbook of the Republic of Slovenia”. Since 2001, the data has been based on the regular reports of business entities (legal and natural persons), who own, hire or manage registered cargo motor vehicles with at least two tonnes of load capacity. The selection of rapporteurs is based on a quarterly sample, the basis of which is the Register of Motor Vehicles administered by the Ministry of the Interior. The data of the Ministry of the Interior is compared with the data of the Business Register of Slovenia. Older data (the period 1992-2000) is assessed on the basis of previous research studies of this transport mode, pilot projects conducted in 1999 and 2000, ongoing research studies of road freight transport, data on the border crossings of cargo vehicles, results of traffic counting and the data on business entities dealing with road freight transport. Road freight transport includes all transport performed by Slovenian vehicles in Slovenia and abroad. However, the data does not indicate the share of routes performed in the domestic network by domestic transport operators with a freight destination or origin abroad. The data on road transport of foreign vehicles in the territory of the Republic of Slovenia is also not available. Data on rail freight transport is provided to the SORS by Slovenske železnice (Slovenian Railways). The data includes all transport in the territory of the Republic of Slovenia. The data on total port transport in Slovenia refers to the ports of Koper, Izola and Piran; the data on the total freight transport at Slovenian airports refers to the Ljubljana, Maribor and Portorož airports (considering all business entities dealing with the indicated activities). The data on air transport and sea shipping includes all transport (also abroad) performed by the Slovenian transport operators Adria Airways and Splošna plovba. Data processing methodology: The modal shares of freight transport are expressed by the indicator of freight transport demand – tkm. A tonne kilometre (tkm) is a measuring unit of freight transport, representing the movement of one tonne per one kilometre. In rail freight transport we distinguish between a gross tonne and net tonne kilometre. A gross tonne kilometre is the sum of multiplications of the entire freight weight (freight and wagon weight without the propelling vehicle) and distances, on which this weight did not change during transport. Net tonne kilometre is the sum of multiplications of the weight of transported freight and actual distances, on which the freight was transported (SORS, 2004). The volume of freight transport is expressed by the sum of all performed tonne kilometres in the considered area and in the determined time period; the structure is expressed by the share of tkm (modal split) by individual transport modes (road, rail, maritime, air). - Advantages and disadvantages (at data level): The available data does not enable a review of the modal shares of tkm, performed by individual years in the territory of the Republic of Slovenia – the data on rail transport is based on the transport in the territory of the Republic of Slovenia; the data for road transport is based on all (domestic and foreign) transport of domestic transport operators. Transport performed by foreign transport operators in the territory of the Republic of Slovenia is not included. The data on tkm for air and maritime transport also does not enable a limitation to the territory of the Republic of Slovenia; therefore, the data on the freight volume at airports and ports is indicated. Furthermore, the older data (1992-2000) on road freight transport is only estimated and not measured. - Relevance, accuracy, robustness, uncertainty: Due to several disadvantageses, the data is fairly inaccurate and unreliable, and more indicative in nature. - Overall assessment (1 = no major comments, 3 = data to be considered with reservation): 2 Projections have not been prepared. Relevance: 2 (Vehicle-kilometre would be a better unit of measurement, since it is more directly linked to the environmental impact of transport movements) Projections have not been prepared. Accuracy: 3 (the non-consideration of tkm of foreign transport operators on Slovenian roads and consideration of tkm that Slovenian transport operators perform abroad; the data on road freight transport for the period 1992-2000 is only estimated) Projections have not been prepared. Completeness over time: 2 (the data on road freight transport until 2000 is estimated, later data was measured) Projections have not been prepared. 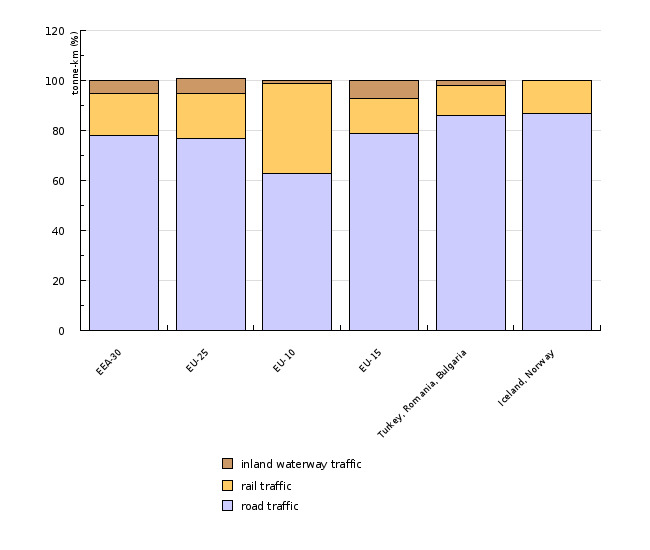 Methodology and frequency of data collection for the indicator: The EEA has been obtaining the data on the modal split in freight transport from the common questionnaire, prepared by Eurostat, the European Conference of Transport Ministers (ECMT) and the United Nations Economic Commission for Europe (UNECE). Data processing methodology: The missing values were obtained by a method of linear extrapolation and by considering the situation in neighbouring countries with a similar level of development in freight transport. Geographical coverage: The EEA-30 includes the group of 30 EEA Member States for which sufficient data was available. That group is composed of the EU-15 Member States (Belgium, Denmark, Germany, Greece, Spain, France, Ireland, Italy, Luxembourg, the Netherlands, Austria, Portugal, Finland, Sweden and the United Kingdom), 10 new EU-10 Member States (Cyprus, Malta, Estonia, Lithuania, Latvia, Poland, Czech Republic, Slovakia, Slovenia, and Hungary), plus Romania, Bulgaria, Turkey, Iceland and Norway. - Advantages and disadvantages (at data level): Data for maritime transport is insufficient. - Relevance, accuracy, robustness, uncertainty: Data is quite reliable, except data for sea transport. - The Slovenian Police, 2009: The number of cargo vehicles on the border between the Republic of Slovenia and Republic of Hungary (from 2004 to 2007). Ljubljana, The Slovenian Police. - SORS, 2004: Glossary for transport statistics (UNECE, ECMT, Eurostat). Ljubljana, Statistical Office of the Republic of Slovenia (23 June 2009). - Šegan, V., 2005. Transport of goods on roads and railways in 2004. Ljubljana, Statistical Office of the Republic of Slovenia (23 June 2009).